On April 20, 1976 I went with some friends to see Bob Dylan’s Rolling Thunder Revue at the Bayfront Center Arena in St. Petersburg. Still in high school, I hadn’t really “discovered” Dylan yet, although I’d taken a shine to Blood on the Tracks and Desire, his most recent records. The songs were unusual and dark and mysterious, but it would be a few years before they really spoke to me, and I realized just how great they actually were. I knew Nashville Skylinepretty well, and of course some of the old hits, but as for myself getting hit (as in over the head), it would be awhile before Bob’s hard-knuckle early works presented themselves to me like an unavoidable bully in a back alley. Rolling Thunder was somewhat analogous to a traveling circus, which made sense for the big, boxy Bayfront because I’d seen Ringling Brothers/Barnum & Bailey there every year as a kid. 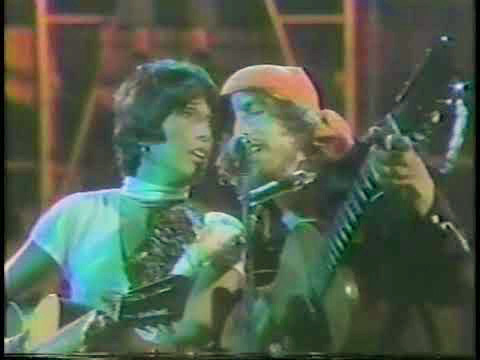 Along with Dylan and his raggedy crew of a band, Joan Baez, Roger McGuinn and Bob Neuwirth took guest turns. It was a rock ‘n’ roll dog and pony show, and it was great. I’d never seen McGuinn before, and this was many years before he moved to Florida and I got to know him and his wife Camilla pretty well. Here, he was still in his cocaine-fueled ‘70s frenzy; he sang “Jolly Roger,” which absolutely slayed me. Baez I could always take or leave; one of her numbers during this leg of Rolling Thunder was “Dancing in the Street,” during which she bopped around awkwardly, proving that aging folkies shouldn’t dance, because they can’t. At some point – maybe it was during intermission – some guys appeared in our midst (we were standing “festival seating” style on the cold concrete floor) – and began handing out little slips of colored paper. These turned out to be printed tickets to a mystery concert that was to be held two days later at the Bellevue Biltmore, a secluded, sprawling, vintage hotel up near Clearwater. I, of course, had never heard of it, but since word on the floor was that it was a ticket for some sort of secret Dylan show, I made sure to hit the guys up for a pair. The opportunist in me was in gestation already. Anyway, the tickets were free. When the day arrived, my friends and I drove up to Clearwater and found the hotel. I was accompanied by my girlfriend, who was even less of a Bob-o-phile than me. But whatever this was, it was surely going to be cool. So there we were. Our instructions were to form a line outside the Starlight Ballroom doors. There were, I imagine, about 200 of us in this line when we got our first clue. A couple of players from the Rolling Thunder band emerged from somewhere in the hotel building and walked across the grass to the ballroom’s stage door. A cheer went up from the throng. They smiled and waved, and were gone. Five minutes later, there was Dylan, surrounded by a phalanx of tall guys. In their midst, he looked very short. He was not wearing his Rolling Thunder hat. People in the line went “Yay!,” and somebody shouted “Bob!” He just sort of glared at us as he walked by. Inside, the ballroom was dressed out like a set from Shindig. A large stage was set up at one end, and behind it and to the sides were three levels of scaffolding. There were lights and TV cameras. Here’s the deal: I can’t remember if we found out then, or later, but this was to be a Rolling Thunder television special, produced by Burt Sugarman of Midnight Special fame. The ushers filled the scaffolds with people; you were led up stairs to the first, second or third levels and instructed to sit on the plywood planks with your legs hanging over the side, facing the stage. We followed instructions. We were to be on the third level. But as our two friends were seated, the usher realized there was no more room. “Follow me,” he said to my girlfriend and I. So back down the stairs we went, dutifully following along. The usher delivered us to the floor in front of the stage, which was covered with a dark Oriental carpet. We were the first people delivered to the floor, and we were instructed to sit down – not four feet from what was surely Dylan’s microphone. The stage was probably two-and-a-half feet high. When everyone was settled in, and the lights faded to black, Dylan emerged, solo, and played “Mr. Tambourine Man.” I could have spit on him. Ironically, several times during the afternoon he spit on me. With each song, we moved a little closer, filling the floor space, so that by the time he got to “Visions of Johanna” I was leaning my elbow on the stage under his mic stand. Every time Bob would blow his harmonica, I felt his spittle on my arm. To make a long story short, this performance – and a later one, with a different audience – were edited together to form a special called Hard Rain. Ultimately, the whole thing was rejected – I always figured Dylan thought the Sugarman set looked cheesy, with its dangling-leg silhouettes – and when Hard Rain aired a few months later, it had all been re-shot at an outdoor show in Colorado. A bootleg video of the Biltmore show, however, does exist. It’s on YouTube and other places online. And there, during “Mr. Tambourine Man,” “The Times They Are A-Changin’” and a couple of others, you can see me. I’m in the shots from the camera positioned at the back of the stage, usually when Bob is finishing a tune to our thunderous applause. My girlfriend had shiny (bottled) blonde hair, and is hard to miss. As the songs progress, you can see us inching closer to Mr. D.
That was the first time I’d ever heard “Visions of Johanna,” which he did twice, for whatever his reasons. Today it is one of my core fave tunes. It is one of the most astonishing and moving pieces of poetry I’ve ever heard. I remember he played “Don’t Think Twice, It’s All Right,” with its labyrinthine verses (like so many of his songs, right?) He got about halfway through it and stumbled. I watched Bob Dylan race to the back of the stage, where a book called Bob Dylan Lyrics (I recognized it) was sitting on a guitar amp. He flipped it open, found “Don’t Think Twice,” checked the words, then came back up and sang the whole thing again. The Rolling Thunder band emerged about halfway through and played behind the two of them; at the later show, I understand, they did everything from “Isis” to “Leopard Skin Pill-Box Hat.” McGuinn showed up for the second show only. At the time, we had no idea there was going to be a later performance. When Hard Rain – the Colorado version – finally aired on CBS, I remember thinking it was pretty cold and crummy, and didn’t have half the life of the show I saw. It was promoted on the cover of TV Guide that week – but the photograph, showing Dylan in a bandana, yowling into a microphone – was from Clearwater.